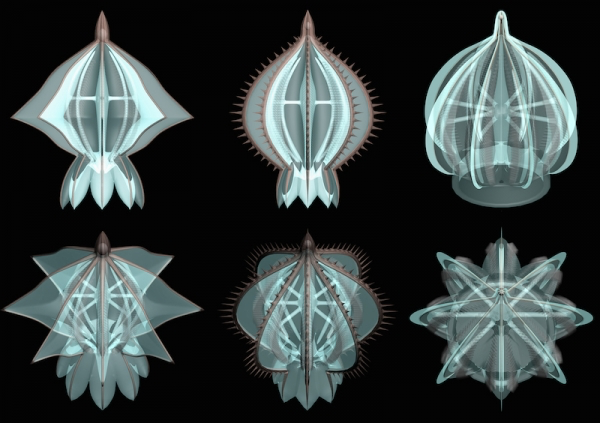 Fossils Show Ancient Jellies Had Beautiful Geometric Skeletons « Adafruit Industries – Makers, hackers, artists, designers and engineers! The 520-million-year-old fossils reveal that ancient comb jellies had stunning geometric skeletons that have disappeared over the course of evolution, researchers report in a paper published in the journal Science Advances. These strange skeletons contained eight rigid plates that surrounded the jellies’ organs and eight spoke-like structures that radiated outward to surround the soft lobes of their bodies. The unusual symmetry of these skeletons makes them aesthetically appealing, but it also likely provided mechanical support for the jellies’ squishy bodies. It may have aided in defense against predators or other dangers as well, the researchers suggest. Comb jellies are found in marine environments around the world, but none of the comb jellies known to exist today have a skeleton. In true modern form, they bring us beauty not through amazing architecture but with an incredibly intricate and colorful light display.